Facebook is planning to launch a new mobile App Center in the coming days — possibly at an app-themed press event that the company is holding this evening in San Francisco. In the meantime, we’ve just received a slew of screenshots from an iPhone-using reader who appears to be seeing it live already. The App Center will officially launch in the next couple weeks. Facebook says its already driving plenty of traffic and the App Center could further assist developers trying to gain traction. 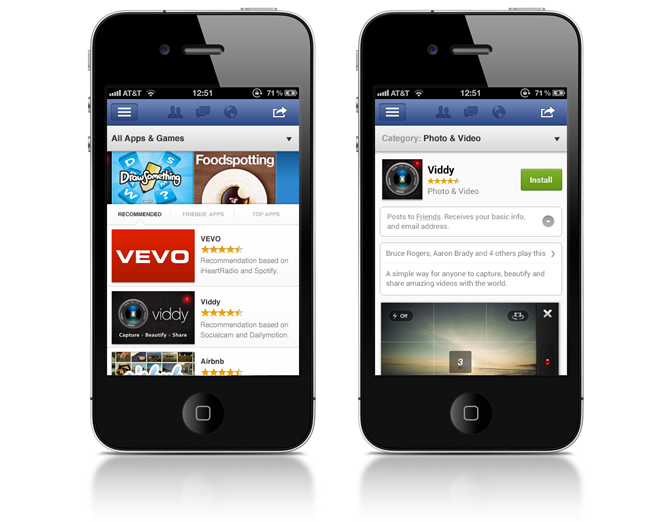 In may, Facebook sent more than 160 million visitors to mobile apps, up from 60 million in late February. So far its been responsible for more than 1.1b app visits. Facebook isn’t just its own app platform trying to compete with Apple and Google, its a social layer that runs across those platforms too. 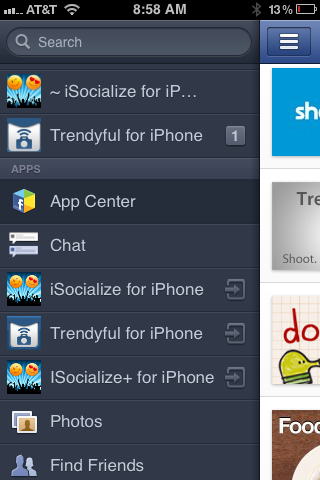 At one point recently, seven of top ten iOS apps and six of top ten Android apps had some Facebook integration. 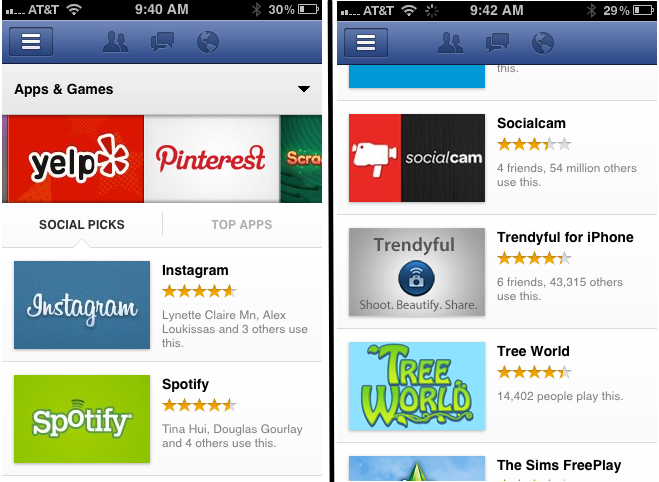 Facebook has been working hard to be more of a mobile platform. It has rolled out mobile sign-on features, mobile versions of its Credits virtual currency, and most recently Open Graph hooks that mobile app developers have been taking full advantage of (witness the turgid rise of Socialcam and Viddy for evidence of those features being exploited). 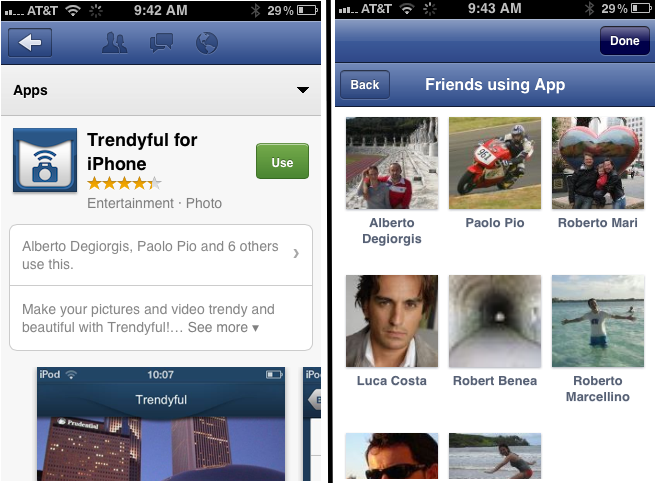 This new interface could get more users downloading Facebook-enabled mobile apps. The main drawback is that Facebook’s mobile app is already so full of features that many users find it hard to use. Stuffing in an App Center isn’t going to ease the load. Users then see a couple of featured apps up top, and can then browse lists of Social Picks based on what their friends are using, and Top Apps that are the highest quality and most popular as determined by Facebook. Clicking through to an app reveals a dedicated page listing what friends use it and what it does, as well as screenshots. You can click through to see photos of all your friends using the app, which could convince users that an app is worth their time. That’s really the strongest part of Facebook’s App Center and what sets it apart from Apple and Google’s marketplaces. On those you have to trust editors and the wisdom of the crowd, but with Facebook you get personalized suggestions based on people you trust.